A Sydney ferry worker has captured the moment a giant wave hit his vessel, in a dramatic photograph. 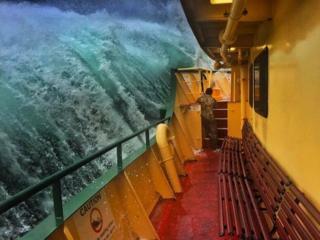 Amateur photographer Haig Gilchrist had taken the picture as the ferry battled through a storm near Sydney Harbour. It wowed thousands when it was posted on his Instagram account on Saturday. Mr Gilchrist, who has worked as a general boat hand on the Manly Ferry for more than a decade, frequently takes photographs of his picturesque daily route and posts them online. "East Cost (sic) Low intensifying," he wrote as a caption for the photo, using a local term for the cyclones which occur along Australia's east coast. "From brilliant sunsets to storms moving in over the water, his photography provides many beautiful images of Sydney Harbour and the iconic Manly Ferry service," his employer Harbour City Ferries said in a statement. Those hoping to take similar shots will be disappointed though. Harbour City Ferries said Mr Gilchrist takes many of his pictures from crew-only access areas. Passengers "shouldn't count on snapping their own stormy weather shots like Mr Gilchrist's - the ferries' safety protocols include passengers' requirement to travel inside the ferry with closed doors during the occasional heightened stormy conditions."